Professor David Marples the University of Alberta who was banned in April from travelling to Belarus is finishing his new book on historical memory and World War II in Belarus. At an Anglo-Belarusian Society event in London last week, he was speaking about the "military" mentality of the Belarusian society, the nation-building process in Belarus, and the West's policy against Lukashenka’s regime, including sanctions and the ice hockey championship. The Canadian historian and political scholar has long been known as one of the best Western experts on Belarus and already published several books including the most recent "The Lukashenka Phenomenon: Elections, Propaganda, and the Foundations of Political Authority in Belarus" (2007). Last year, he became the president of the North American Association of Belarusian Studies. "First time I visited Belarus in 1992, and since then I travelled to the country every year," says Marples. However, this April the researcher was denied a Belarusian visa. "That was the first time I applied to the Belarus consulate in Canada, but not in the US. The explanation he received from the embassy was very brief: "You have been denied entry to the Republic of Belarus. Best wishes, Igor." Marples ended up on the black list of foreign politicians, public figures, human rights activists and scientists who were denied entry to Belarus. In contrast to the official list of Belarusian officials who are banned to travel the EU countries, Lukashenka’s regime imposes restrictions quietly and secretly. Marples himself assumes that officials of the embassy were just afraid to issue a visa the man who could cause some problems in the current political relations between Minsk and the West. For the last three years, Marples has been studying historical memory and World War II in Belarus. In other words, the historian examines how the state’s control over historical memory in Belarus affects formation of the Belarusian nation. While collecting the data for his book, Marples travelled across Belarus extensively, met a wide range of people, and studied Belarusian sources. From the catalogues of the National Library of Belarus, he learned that as many as 1,500 book titles on WWII were published in Belarus between the years of 2005 and 2010. "It is a huge figure," says the researcher. He highlights that an anti-Soviet sentiment is gaining strength in both Baltic States, and Ukraine (especially the Western part). Crimes of the Soviet regime have become exposed, and those who stood against the Communists are glorified as national heroes. Belarus demonstrates a totally different trend. "The Great Patriotic War" is the defining element of historical memory and the basis for the formation of modern collective identity in Belarus," Marples points out. According to the researcher, Lukashenka is trying to build the nation around the thesis of the Great Victory over the Nazis gave Belarusians freedom and independence. Moreover, the regime is seeking to fulfil nation-building process on the basis of political rather than ethnic principles. The historical experience of the "first Belarusian state" the Grand Duchy of Litva (Lithuania) along with national values such as the Belarusian language are defiantly ignored. On the other hand, Lukashenka’s ideologists attempt to rehabilitate Joseph Stalin and to level crimes of the Soviet regime which damaged Belarus more than any other Soviet republic. Marples emphasises that even the current rulers of Russia have condemned Stalin's repression and paid tribute to the victims. Lukashenka has not done anything like that for 18 years of his reign. On the contrary, Belarus authorities use the tragic events of 1941-1944 (according to different calculations, Belarus lost from one third to one forth of its population due to WWII) to replace the monstrous crimes of the totalitarian system in the public memory. Memorials and monuments to Soviet heroes, state-financed film production, the shift of the Independence Day’s date, rewriting of school textbooks are all designed to strengthen the propaganda which is a very close in its nature to the Soviet one. Moreover, says Marples, the regime uses WWII issues as a weapon against political opponents – Lukashenka calls the opposition "collaborators" and "public enemies" – and means for positioning its geopolitical interests – "brotherly Russia" and a hostile image of the West and NATO. David Marples predicts the Soviet military myth will dominate in the collective consciousness of the Belarusians as long as Lukashenka stays in power. At the same time, he does not think that the majority of Belarusians believe the history of their country began in 1944. But many still do not know who they are. It takes time to implement a new consolidating myth based on national and democratic values in the collective consciousness of the nation." Will Belarus survive without its mother tongue? In his most famous book "Belarus: A Denationalized Nation" Marples wrote, “For Belarus, national development without the native language, especially under the shadow of a much larger Slavic neighbour with a lengthy historical tradition as an empire, was virtually impossible.” Is there any future for a sovereign Belarusian state without the Belarusian language as the core element of the state’s ideology? “I think it is possible. First of all, on the ground of civic nationalism," answers Marples. He is convinced that the pursuit of national movement put the issue of Belarusian language in front of the democratisation process was premature in the early 1990s. Even the fact that the Belarusification of started with an absence of all necessary teaching materials, it did not contribute to its promotion among the population. 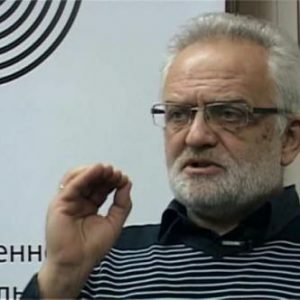 As a result, the Belarusian Popular Front’s leader Zianon Pazniak is still seen as a radical and a threat to all Russian speakers in the collective consciousness of Belarusians. However, the researcher believes that there are no reasons to "bury" the Belarusian language. "I am impressed by the number of people who use the Belarusian language on the Internet and social networks. This is mostly a younger generation of the 1990s," he says. But in order to seriously improve the prestige and the popularity of the Belarusian language in Belarus, political conditions are needed. "Every Canadian knows that it is impossible to build a career in government system without knowledge of two languages ​​- English and French. Belarusian parents should also know that the Belarusian language, which their children learn in school, will be needed in the university and for further career." Why do the Western sanctions harm? According to Marples, an interest in Belarus has increased significantly in the West over recent years. Moreover, researchers and experts represent a wide spectrum of opinions: from the policy of tough sanctions against the Lukashenka’s regime and its isolation to the maximum possible dialogue with the official Minsk. Marples himself believes that the strategy of sanctions regarding Belarus is harmful, because it isolates the Belarusian society and pushing the country towards Russia. 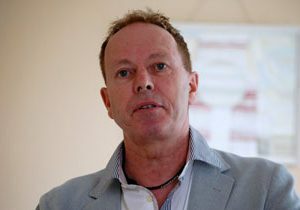 The former British Ambassador to Belarus Brian Bennett who was also present at the Anglo-Belarusian Society event disagreed: "This is Lukashenka who isolates Belarus, not we. He wants to benefit and to keep a distance from both the West and Russia at the same time." "Yes”, replied Marples, “but there are many layers in the Belarusian society with whom we should speak and whom we should help. Recent studies of IISEPS show a decrease in pro-European and the growth of pro-Russian sentiments in the society because Belarusians do not see any real help from the West." He points out the more contacts, information, and experience exchange will take place between Belarusians and the West the more chances Belarus will have to become a part of the civilized world. This article originally appeared in Belarusian on svabodaby.net. Belarusian scholars devoted significant attention to the structure and of the Belarusian society and what drives local democracy and motivation of Belarusians. New edition of Belarus Headlines. The VIII issue of Belarus Headlines commemorates the one year anniversary of prominent Belarusian political scholar Vitali Silitski’s passing. Dr Silitski served as academic director of BISS and left a profound legacy for Belarusian political science. In this issue Belarusian and Western experts share their memories of Vitali as a person and reflect on the relevance of his works today. We Need to Destroy ‘Moscow’ in Belarusians’ Minds – Uladzimir Matskevich, philosopher and methodologist, specified the terms used under his Cultured Politics program, and summed up some results of the program’s activity during a public lecture under the "Urbi et Orbi" series. He reminded about the main thesis – "To think Belarus", as well as about the key categories, which are to use within the framework of the Cultured Politics: "politics", "culture", "to think / to conceive", "Belarus". Sociological Study on the Composition of the Belarusian Society – a new policy study by Dr. Anaïs Marin was requested by the European Parliament's Committee on Foreign Affairs. Building on the results of independent sociological surveys, this study tries to assess the worldviews, social needs and dividing lines among Belarusian society ahead of the 2012 legislative elections. It critically reviews the EU’s 'dual track' policy and instruments and calls for adopting a new strategy to draw the country closer to the EU while circumventing its authoritarian leadership. The study advocates a more inclusive approach of neighbourhood relations, allowing for mutually beneficial cooperation for the sake of modernising and hopefully democratising Belarus. Civil Sector in Belarus – Everyday Life and Organizational Processes – Vital Silicki wrote this article as part of the integrated study “Belarus’ NGO Sector: Potential for Change,” conducted by a research team at the commission of several Belarusian NGOs from 2005 through 2009. The author is looking for answers to the question how the civil community in Belarus is capable of promoting democratic changes in society in the context of the idea of civil society’s self-value as the “fire keeper” and bearer of social spirit, whose experience, values and capital will catalyse transformations in Belarus under the right circumstances. Is There Any Future For the Idea of “Local Democracy”? – Ulad Vialichka, the chairman of the international consortium "EuroBelarus", considers about the prospect of the idea of ​​"local democracy" based on his participation in the General Assembly of the Association of Local Democracy Agencies (June 7-8, Italy). In particular, the expert notes that "Belarus is now very far from implementing the idea of ​​local democracy. But if we want to change our life for the better, we need to think and act". In Belarus We Have Something To Fight For – Alexander Stelmakh, the director of Onliner.by, talks about his life philosophy and political views. Among his most bright quotations are the following: “Lukashenka is not the reason, but a result”; “If you don’t like your salary – work more”; “People must understand that before the fight for European values and human rights starts, they need to figure out what they want, how they make money, what they are doing; and get rid of the feeling that someone owes them a job, a salary, an apartment and a loan”. Special Issue on the Future of Belarus – the Pan-European Institute publishes a quarterly discussion forum, Baltic Rim Economies, which focuses on the development of the Baltic Sea Region. The Special Issue on the Future of Belarus, published on June 19, includes a number of articles by Belarusian and foreign analysts: David R. Marples, Alexander Brakel, Sergey Kizima, Torbjörn Becker, Alexander Chubrik, etc. Review-Chronicle of Human Rights Violations in Belarus in May 2012 (in English) – Human Rights CentreViasna has issued its monthly review of human rights violations in Belarus. The experts note that May did not bring any positive changes in the human rights situation in general and the situation of political prisoners in particular. How the Belarusians Treat the Trade Unions – in May 2012, Zerkalo Nedeli polling agency conducted a trade union survey. In particular, 50% of Belarusians are not members of any trade union, while 43% are members of the official Federation. Only 3% of respondents said they were members of an independent union. Only 7% of members of independent trade unions are unsatisfied, more or less, with how the union is protecting their interests; the share of unsatisfied Federation members is 46%. Economic Development of Belarus in January-May 2012 (audio) – Yaroslav Romanchuk, Analytical Center "Strategy", and Anton Boltochko, the Liberal Club (the CASE Program on PRIMUS) sum up the results the economic development of Belarus for the first five months of 2012. In particular, experts note the trends of the inflationary failure with insufficiently tight monetary policy, as well as growth in retail trade by 7.7% with falling of real disposable per capita income by 0.1%. Belarus: Scenarios of a Common Future – the Cytadel project presents the verbatim and audio report of the round table which took place on May 24, in Minsk. Participants come from different ideological positions (Eurasian, West-Rusizm, Liberal), but trying to find common points for the successful development of Belarus. Belarus is Interested in Development of Legislation on Charity – Olga Smolianko, the director of the Legal Transformation Center, comments the National program for international technical cooperation in 2012-2016, approved on May 4, 2012. The National program contains 114 project suggestions, characteristics of international technical assistance projects, submitted by republican state bodies and other interested actors for 411,5 million USD. Analytical Paper. May 2012 – Belarusian Security Blog released its monthly analytical paper which states the weakening of the stability of Belarusian state. The experts believe that it is connected with increase of systemic problems in public administration, defence, and foreign politics in the absence of clear leadership plan to correct the situation.